This article explores the presence and role of the Golden Ratio, the Fibonacci numbers Fn and the Lucas numbers Ln in the sacred geometries of the Platonic solids, the outer & inner Trees of Life and their polyhedral counterparts — the 144 Polyhedron and the disdyakis triacontahedron. F8 is the number of geometrical elements in the Lower Face of the Tree and F9 is the number of elements in its Upper Face, F10 being the number of elements in the whole Tree. 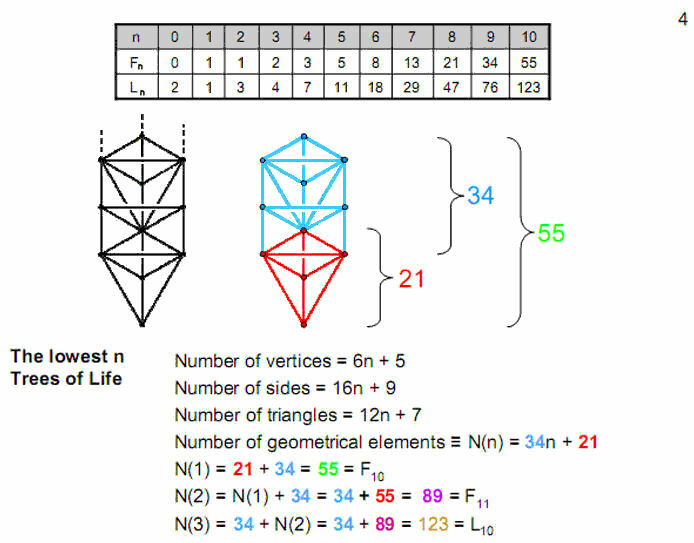 L10 is the number of geometrical elements in the three lowest Trees of Life mapping three-dimensional space. F10 measures the inner Tree of Life as the 55 corners of the 48 sectors of its seven separate polygons. L9 is the number of corners of the seven enfolded polygons that are not also their centres. 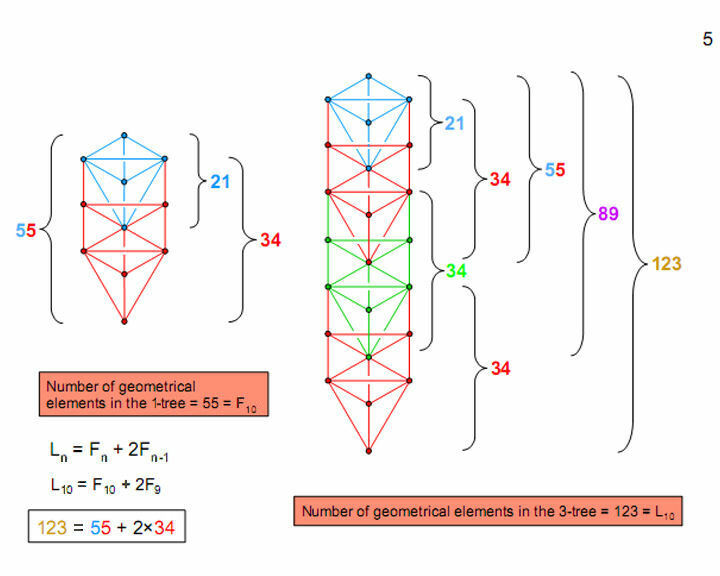 F9 (=34) is the number of corners associated with the seven enfolded polygons enfolded in successive overlapping Trees of Life. It is also the number of geometrical elements added by them. The length of successive twists of the DNA molecule is about 34 angstroms. The 21:34 division of geometrical elements in the outer Tree of Life manifests in the 21 vertices & centres of the first three Platonic solids and the 34 vertices & centres in the last two. It also appears in the first four Platonic solids as the 210 triangles, polyhedral vertices & sides in their faces and as the remaining 340 elements in all five solids. 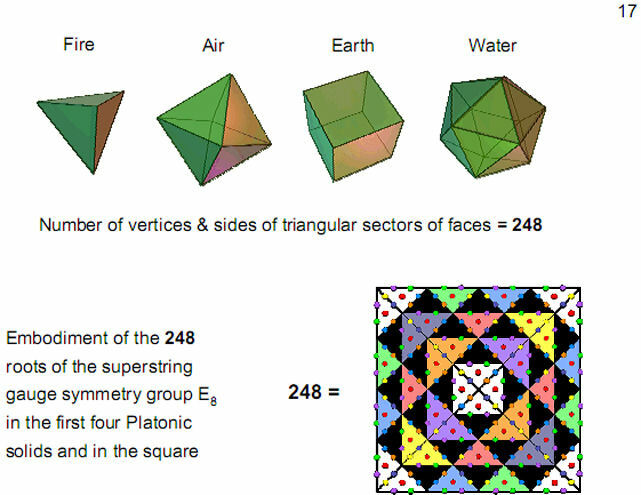 The former embody the dimension 248 of the exceptional Lie group E8 describing superstring forces as the 248 corners & sides of the 120 sectors of their 38 faces. This number is embodied in the lowest Tree of Life as the 248 yods below its apex. 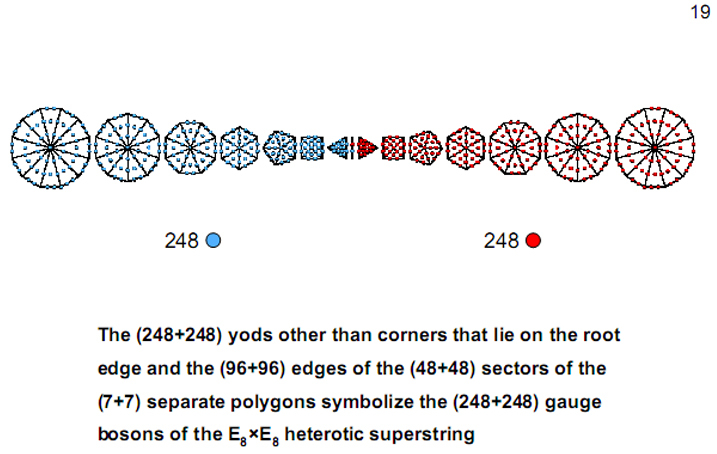 The (248+248) yods other than corners in the root edge and (7+7) separate polygons symbolize the (248+248) roots of E8×E8. The 1370 yods lining edges of the tetractyses needed to construct the five Platonic solids is the counterpart of the 1370 yods in the inner Tree of Life. L10 is the average number of geometrical elements in each half of these solids. F10 is the average number of elements in the faces of each half. The average number of internal geometrical elements (including centres) is 137, showing how the Platonic solids embody the number determining the fine-structure constant in physics. The relation L10 = F10 + 2F9, which appears in the three Trees of Life mapping three-dimensional space, manifests in the five Platonic solids - the only regular polyhedra that can exist in such a space. These Trees encode the 206 bones in the human skeleton and the 361 classical acupuncture points. L10 is the number of Pythagorean intervals between the notes of the seven musical scales. In the ancient practice of gematria, consecutive letters of an alphabet are assigned the integers 1-10, 20-100 & 200-900. This means that words have numerical values that are the sum of their letter values. Words in religious texts with the same number values, however different they were, were considered to possess some kind of analogy, implying that the textual passages in which these words were located were connected in a subtle way and allowing levels of meaning beyond the literal to be uncovered in these sacred writings. In Kabbalah, the ten Divine Qualities, or Sephiroth, manifest in the four Worlds of Atziluth (Archetypal World), Beriah (World of Creation), Yetzirah (Formative World) and Assiyah (World of Action). The divine names that are assigned to the Sephiroth embodying the archetypal essence of God function in Atziluth. The Archangels assigned to each Sephirah operate in Beriah, the ten orders of angels exist in Yetzirah, whilst the Mundane Chakras are regarded as the physical manifestations of the Sephiroth, some being assigned one of the sacred planets (to be understood in their astrological, not astronomical, sense). The table in Figure 1 lists the gematria numbers of the Hebrew names of the Sephiroth, the Godnames, Archangels, Orders of Angels & Mundane Chakras. A few of the numbers, such as those of Elohim, Elohim Sabaoth and Cholem Yesodeth differ from those stated by standard works on Hebrew gematria. This is because these texts provide only numbers that are the sums of their letter values. They take no account of the possibility of contraction, wherein a sum of such values, or even an individual one, can be reduced to another number if it is a multiple of 10. For example, the letter value 40 of the Hebrew letter mem (מ) can be reduced to 4 because 4 + 0 = 4, as can the letter value 400 of tav (ת). Whether such contraction is required depends upon the context in which these words occur. Thirty years of correlating the gematria number values of the Sephiroth in the four Worlds with the properties of sacred geometries and with the mathematics underlying superstring theory has proved to the author that contraction occurs in a few of these number values. An example germane to superstring structure will be discussed later on in this article. At the heart of the Jewish mystical tradition called ‘Kabbalah’ is the Tree of Life, or Otz Chiim . It represents Adam Kadmon, or “heavenly man.” The ten “Divine Qualities,” or Sephiroth (singular: Sephirah) are represented by ten circles. The first three — Kether (Crown), Chokmah (Wisdom) and Binah (intelligence) — constitute the Supernal Triad. They head the Pillars of Equilibrium (central column), Mercy (right-hand column) and Judgement (left-hand column). The seven remaining Sephiroth are called the Sephiroth of Construction. They are Chesed (Mercy), Geburah (Severity), Tiphareth (Beauty), Netzach (Victory), Hod (Glory), Yesod (Foundation) & Malkuth (Kingdom). Between Binah and Chesed on the Pillar of Equilibrium is Daath (knowledge). It is not a Sephirah but a stage of transition from the subjective level of God to the seven Sephiroth of Construction expressing the objective nature of God. The Sephiroth are connected by 22 straight lines, or Paths. As a three-dimensional object, the Tree of Life consists of 16 triangles with 22 edges and ten corners. 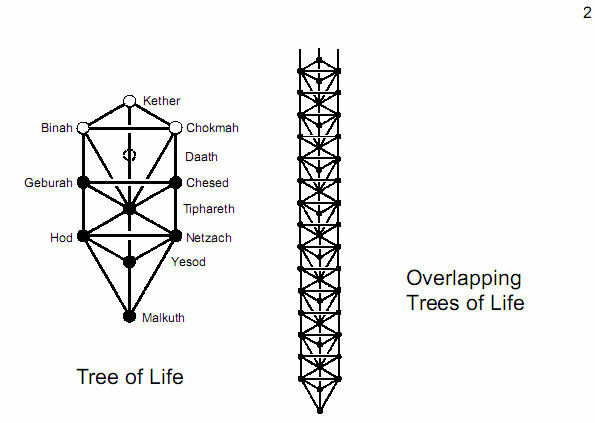 Traditional Kabbalah considers only the generic single Tree of Life and the four overlapping Trees that represent the Archetypal World (the domain of the Divine Names), the Creative World (the archangelic level), the Formative World (the angelic realms) and the World of Action (physical universe). However, it has been shown in earlier articles that 91 overlapping Trees of Life (called the "Cosmic Tree of Life," or CTOL) map all levels of physical and superphysical reality. Figure 2 shows the lowest seven Trees. They map 26-dimensional space-time predicted by string theory and which is prescribed by YAHWEH, the Godname Chokmah whose number value is 26.
is called the ‘Lower Face’ of the Tree of Life. Its ‘Upper Face’ is the five Sephiroth above Tiphareth.  Here, the names will be meant to refer not only to the corners of triangles but also to the space enclosed by the triangles themselves, as well as to their edges (Paths). This means that the triangular space with Chesed, Tiphareth & Netzach at its corners belongs to the Upper Face even though the dotted line joining Tiphareth & Netzach is a Path that belongs to the Lower face. Similarly, the space within the triangle with Geburah, Tiphareth & Hod at its corners belongs to the Upper Face, which comprises every corner, edge & triangle outside the Lower Face. 0, 1, 1, 2, 3, 5, 8, 13, 21, 34, 55, 89, 144,…. where L0 = 2 & L1 = 1. To emphasis their presence, all Fibonacci and Lucas numbers will henceforth be written in colour. The Lower Face of any Tree of Life in a set of overlapping Trees contains 21 points, lines & triangles. This is F8. It is also the number value of EHYEH, the Godname of Kether (see Fig. 1). Its Upper Face contains 34 geometrical elements. This is F9. A whole Tree of Life has 55 elements. This is the tenth Fibonacci number F10. Thirty-four more elements are needed to construct successive, overlapping Trees. Two overlapping Trees have 89 elements. This is F11. Three overlapping Trees possess 123 elements. This is the tenth Lucas number L10. The significance of this particular set of Trees will be revealed later. because 34 is the number of geometrical elements in the Upper Face of the third Tree and 89 is the number of elements below it. L n = Fn + 2Fn−1. Fn+1 = Fn−1 + Fn . For n = 10, L10 = F10 + 2F9 = 55 + 2×34. This has the natural meaning in the context of the three lowest overlapping Trees of Life as the 55 geometrical elements of either the lowest or highest one and as the 34 elements added by each of the next two Trees. This relation between Lucas and Fibonacci numbers, illustrated for n = 10, will be shown to apply to the total geometrical composition of several other holistic systems that possess sacred geometry. Earlier articles proved the equivalence of these systems, so that it is safe to infer that all such systems conform to this equation, at least for n = 10, if not for all n<10. triangle, square, pentagon, hexagon, octagon, decagon, dodecagon. Those in one set are the mirror image of their counterparts in the other set. They share one edge — the vertical “root edge,” as it has been called in previous articles. This geometrical object is implicate in the geometry of the circles whose intersection create overlapping Trees of Life. They represent a hidden geometrical potential that is possessed not only by a single Tree but by every overlapping Tree because, when straight lines are drawn through the blue and red dots of the circles generating the next higher Tree, they intersect at the corners of another set of 14 regular polygons. The form of the Tree of Life known to Kabbalists is but its outer form. The 14 regular polygons constitute its inner form. They have 70 corners. Their 94 sectors have 80 corners, where 80 is the number value of Yesod. Notice that the corners of the triangles coinciding with Chesed and Geburah are the centres of the two hexagons. Also, the outermost corners of the two pentagons coincide with the centres of the decagons. 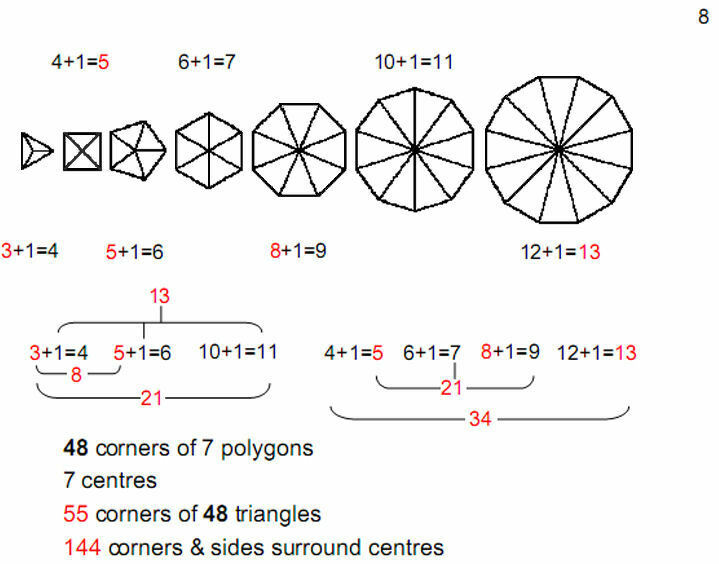 This means that the sectors of the 14 polygons have 76 corners that are not also centres of polygons. 76 is the number value of YAHWEH ELOHIM, the Godname of Tiphareth. It is also the ninth Lucas number. When separated, each set of seven polygons have 48 corners. According to the table of gematria number values of the Sephiroth shown in Fig. 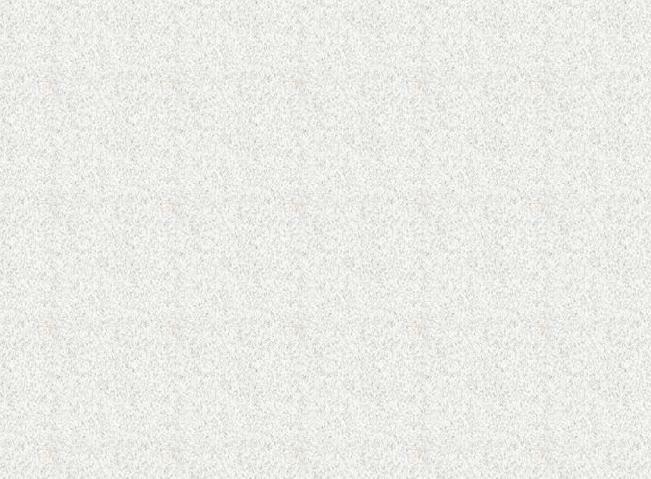 1, this is the number value of Kokab , the Mundane Chakra of Hod. It is not coincidental that this number appears in this context because many previous articles have demonstrated that the inner Tree of Life is prescribed by the Godnames and manifests all the number values of the Sephiroth in the four Worlds. Including the centres of the seven polygons, their 48 sectors have (48+7= 55) corners. 55 is the tenth Fibonacci number F10. 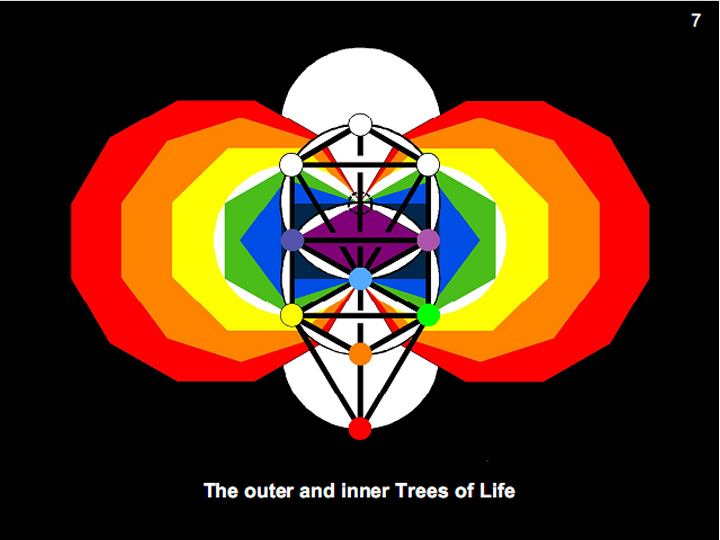 This is the counterpart in the inner Tree of Life of the 55 geometrical elements in its outer form. In either case, it is a measure of the form or shape of a holistic system. The numbers in the Fibonacci series less than 55 can be identified by distinguishing between the corners of each polygon and its centre (denoted “1” in Fig. 1). The sectors of the triangle, pentagon & decagon have 21 corners and the sectors of the square, hexagon, octagon & dodecagon have 34 corners. Each Fibonacci number divides into smaller Fibonacci numbers that measure subsets of polygons. The twelfth Fibonacci number 144 is the number of corners and sides of the 48 sectors of the seven separate polygons. 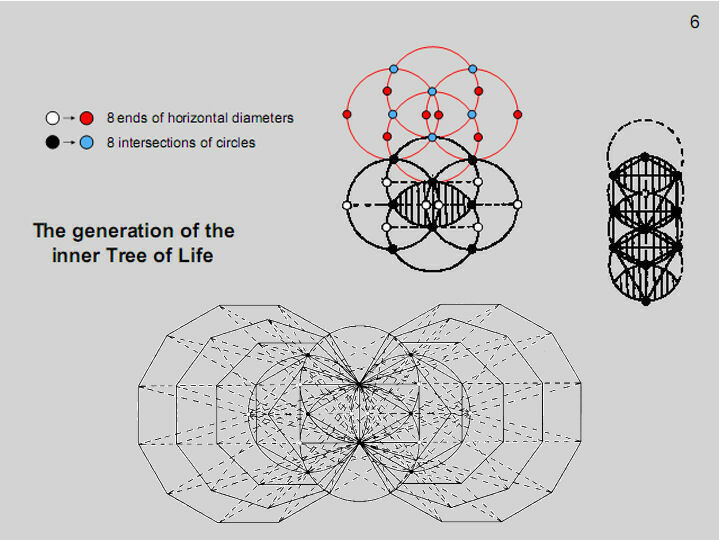 The outer Tree of Life has 16 triangles with ten corners and 22 edges. These 48 geometrical elements are the counterpart of the 48 corners of the seven separate polygons. Just as seven elements are added when the Tree of Life becomes the lowest Tree of Life, so seven corners are added by dividing the seven polygons into their sectors. so that N(n+1) – N(n) = 34. C'(n+1) – C'(n) = 34. The ninth Fibonacci number 34 measures the geometrical composition of successive Trees of Life and the corners associated with the seven polygons enfolded in them. 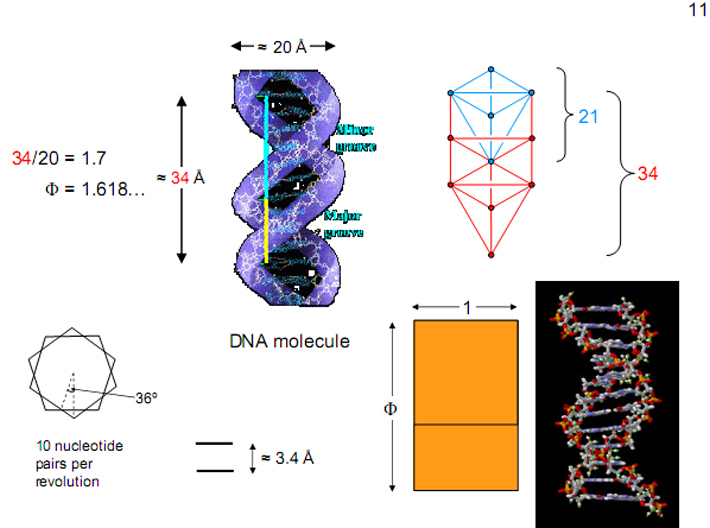 The width of the DNA molecule is 20 angstroms, to the nearest integer (1 angstrom = 10-8 cm). One 360 degree turn of DNA measures about 34 angstroms in the direction of the axis. These lengths, 34:20, are in the ratio of the Golden Mean Φ within the limits of the accuracy of the measurements (compare 1.7 with 1.618… ). It is remarkable that its two dimensions, rounded off to the nearest integer, are so close to two Fibonacci numbers. Each DNA strand contains periodically recurring phosphate and sugar subunits. There are ten such phosphate-sugar groups in each full 360 degree revolution of the DNA spiral, the average vertical distance between base pairs being 3.4 angstroms. The amount of rotation of each of these subunits around the DNA cylinder is therefore 36 degrees. This is exactly half the pentagon rotation, showing a close relation of the DNA sub-unit to the Golden Mean and refuting the suggestion that the closeness of the length and width of one helical turn of the DNA double helix is merely coincidental. The coiling of the two helical strands of the DNA molecule creates a major groove 22 angstroms wide and a minor groove 12 angstroms wide. Their relative proportion is 22/12 ≈ 1.545… . This differs from the Golden Ratio Φ only by about 4.5%. The two strands of the DNA molecule are held together by non-covalent hydrogen bonding between pairs of nitrogen bases. There are four types: adenine (A), thymine (T), guanine (G) & cytosine (C). They form the rungs of a ladder whose sides are alternating sugar and phosphate groups and which spiral around each other in opposite senses. Base A always pairs with base T and base C always pairs with base G. When a cell prepares to divide, the DNA helix splits down the middle and becomes two strands. These single strands serve as templates for building two new, double-stranded DNA molecules - each a replica of the original DNA molecule. In this process, an A base is added wherever there is a T base, a C where there is a G, and so on until all the bases once again have partners. The genetic code consists of (4×4×4 = 64) triplets of nucleotides called codons (64 i s the number value Nogah , the Mundane Chakra of Netzach). With three exceptions, each codon encodes for one of the 20 standard amino acids used in the synthesis of proteins. RNA is a single-strand molecule with a much shorter chain of nucleotides than DNA. Instead of thymine, the complementary base to adenine is uracil (U), an unmethylated form of thymine. Figure 12 shows the 64 codons of messenger RNA (mRNA). An anticodon is a sequence of three adjacent nucleotides in transfer RNA (tRNA) that correspond to the three bases of the codon on the mRNA strand. An anticodon is complementary to the codon in mRNA that binds to it and designates a specific amino aid during protein synthesis. For example, the anticodon GUA is the complement of the codon CAU because G is the complement of C and U is the complement of A. The four bases appear (64×3 = 192) times in each set of 64 codons or anticodons. Each base appears (192/4 = 48) times, where 48 is the number value of Kokab , the Mundane Chakra of Hod, the next Sephirah after Netzach. There are 96 instances of A & C that bind to the 96 instances of their respective complements U & G.
Compare this pattern with the table of 64 hexagrams that form the basis of the ancient Chinese system of divination known as ‘I Ching.’ Each hexagram is a pair of trigrams (triplets of all combinations of lines & broken lines denoting the polarities of yang & yin). The 64 trigrams in one diagonal half of the 8×8 array comprise 192 lines & broken lines (96 yang lines & 96 yin lines). The 64 trigrams in the other half of the array similarly consist of 192 lines and broken lines. The 32 hexagrams in this half are the inversions of those in the other half, so that they comprise the same set of 64 trigrams. 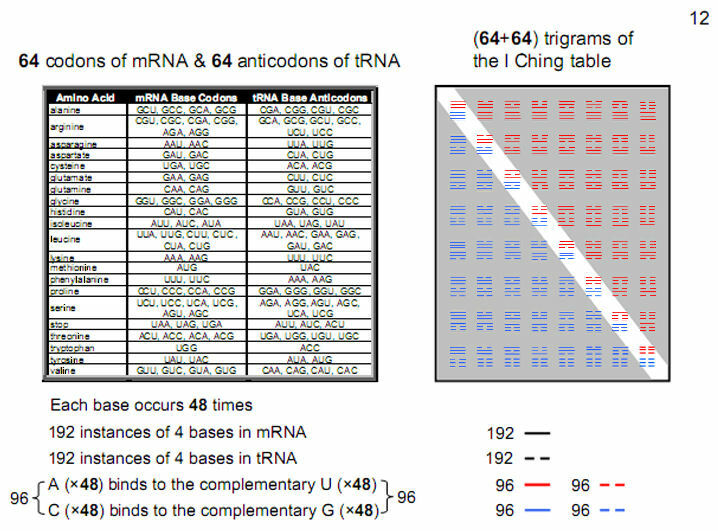 The 64 trigrams in one diagonal half of the table correspond to the 64 mRNA codons and the 64 trigrams in its other half correspond to the 64 tRNA anticodons. The yang/yin duality of lines & broken lines manifests in RNA as pairs of complementary bases, which create 64 codons and 64 anticodons. The 96 lines in each half correspond to the 96 instances of the non-bonding A & C. The 96 broken lines in each half correspond to the 96 instances of their non-bonding complements U & G (for more details, see ref. 2). The counterpart in the inner Tree of Life of the 48 instances of each of the four types of bases in the DNA molecule is the four types of geometrical elements making up the 48 sectors of the seven separate regular polygons. There are 48 vertices, 48 external sides, 48 internal sides & 48 triangles. The pair of geometrical elements (repeated 48 times) forming the boundaries of the polygons correspond to either the non-bonding pair (A,C) or (G,U) and the pair of internal elements (repeated 48 times) correspond to, respectively, either (G,U) & ((A,C). 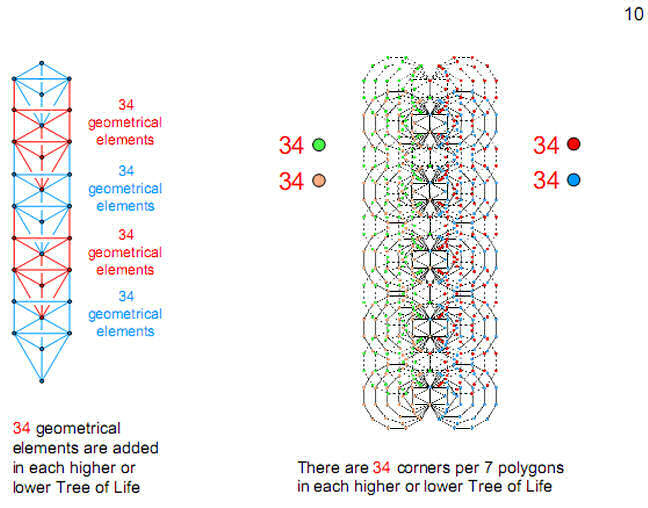 The 192 geometrical elements in one half of the inner Tree of Life are the geometrical counterpart of the 192 instances of the four bases making up the 64 codons in mRNA and the 192 lines & broken lines in a diagonal half of the I Ching table. The 192 elements in the mirror image half of the inner Tree of Life are the counterpart of the 192 instances of the four bases making up the 64 anticodons in tRNA and the 192 lines & broken lines in the other half of the table. The mirror reflection of each element belonging to one set of polygons into its counterpart in the other set corresponds to replacing A, C, U & G in the 64 codons by their respective complements U, G, A & C in the 64 anticodons (for more details about the geometrical counterpart of the 64 hexagrams and the 64 codons & anticodons, see ref. 2). Yantras are the yogic equivalent of mandalas, used by Hindus and Buddhists as objects of meditation. The Sri Yantra is the most revered of these plans or charts that map Man’s inward journey from physical existence to spiritual enlightenment. It is generated from nine primary triangles. Five downward-pointing triangles symbolizing the feminine, creative energy of the Goddess Shakti intersect four upward-pointing triangles symbolizing the masculine, creative energy, popularly conceived in India as the God Shiva. Their overlapping generates 43 triangles. Forty-two triangles arranged in four layers of eight, ten, ten & 14 triangles surround a downward pointing triangle whose corners denote the triple Godhead, or Hindu Trimûrti of Shiva, Brahma & Vishnu. At its centre is a point, or bindu, representing the Absolute, or transcendental Unity. When the 43 triangles in the 3-dimensional Sri Yantra are tetractyses, 378 yods surround the central tetractys (note that the outward-pointing corners of the triangles in the highest three layers lie above the joined corners in the layer next below the triangle in question. These corners are represented by circles that are split into two differently coloured halves; one half denotes a corner of a triangle in one set and the other half denotes a corner in the adjacent set ). 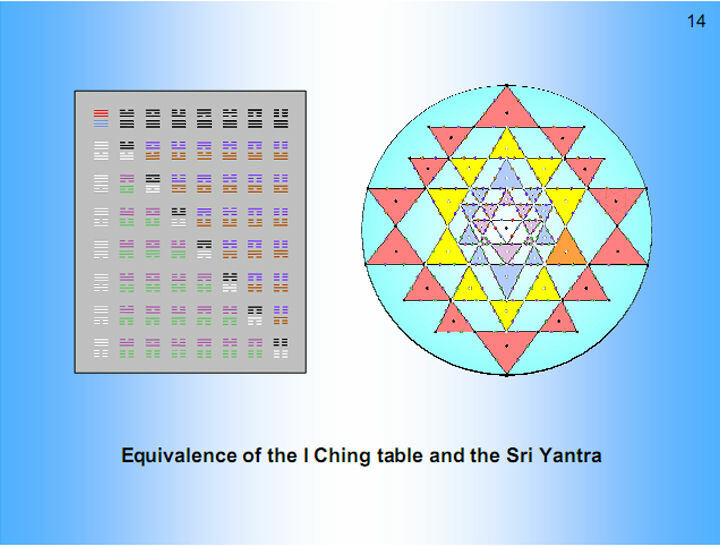 The two triplets of red and blue hexagonal yods in the central tetractys correspond to the two trigrams of the Heaven hexagram in the top left-hand corner of the I Ching table. Each pair of triplets of hexagonal yods in a triangle (one displays dashes connecting a pair) corresponds to a pair of trigrams in a hexagram. The 384 yods composing the Sri Yantra other than the corners and centre of the central triangle correspond to the 384 lines & broken lines of the 64 hexagrams (3). They have 50 vertices (black dots) and five centres (red dots), so that the 180 sectors of their faces and the 90 interior triangles formed by their edges have 55 corners. 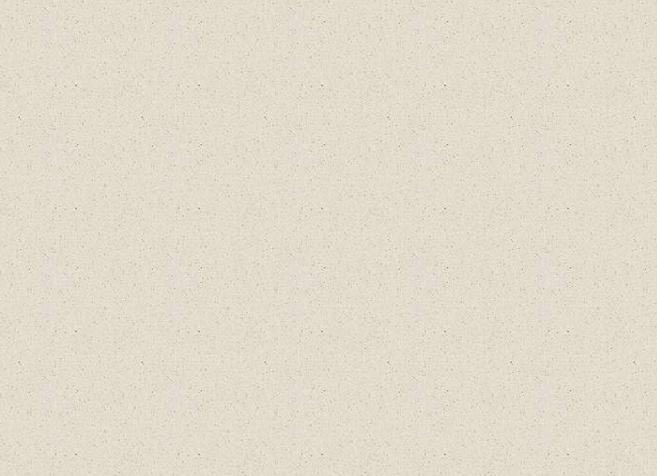 This is F10. The tetrahedron has 5 centres & vertices, where 5 is F5. The first three solids have 21 centres & corners and the icosahedron & dodecahedron have 34 centres & vertices. 21 is F8 and 34 is F9. The icosahedron has 13 centres & vertices. This is F7. The dodecahedron has 21 centres & vertices. This is F8. We see that the five Platonic solids display five of the first ten Fibonacci numbers. The other five are present as well, although less explicit because they mix points in several solids. As 21 = 8 + 13, F6 appears as the 8 points that are either centres of the octahedron & cube or vertices of the former, whilst F7 appears as the 5 centres & vertices of the tetrahedron and as the 8 vertices of the cube. The 5 points of the tetrahedron are further reducible to its centre (F1), an apex (F2) (this pair makes F3 (= 2 )) and the 3 vertices of its base (F4). Comparing this pattern with the geometrical composition of the lowest Tree of Life, the 55 points in the set of five Platonic solids corresponds to the 55 points, lines & triangles making up the Tree, the 21 points in the first three solids correspond to the 21 geometrical elements in the kite-shape that is part of the Upper Face and the 34 points in the icosahedron and dodecahedron correspond to the 34 elements in the remainder of the Tree. The sum of the 180 angles subtended by the 90 edges of the five Platonic solids is 14400. This is the square of the sum of the squares of the first four even integers. The average of these angles is 80º. The sum is equivalent to 40 circles, where 40 = 4 + 8 + 12 + 16, and to 80 half-circles, where 80 is the number value of Yesod. These properties illustrate the Tetrad Principle (4), which states that the fourth member of a class of mathematical object, or the sum of the first four members, quantifies the properties of holistic systems that display sacred geometry, such as the Platonic solids. 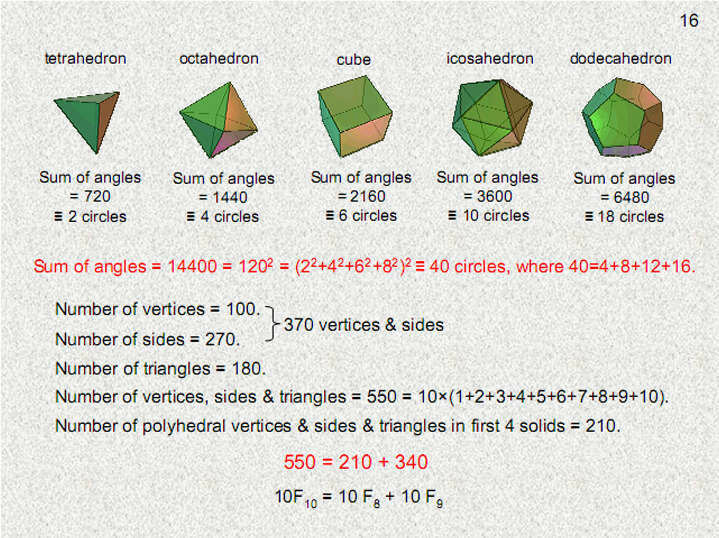 When the 50 faces of the five Platonic solids are divided into their sectors, there are 550 points, lines & triangles. This is ten times the sum of the first ten integers, showing how the Decad determines the geometrical composition of the faces. Also, 550 = 10F10, where F10 (= 55) is the tenth Fibonacci number. 550 = 210 + 340 = 10×( 21 + 34). 21 is the eighth Fibonacci number and 34 is the ninth such number. 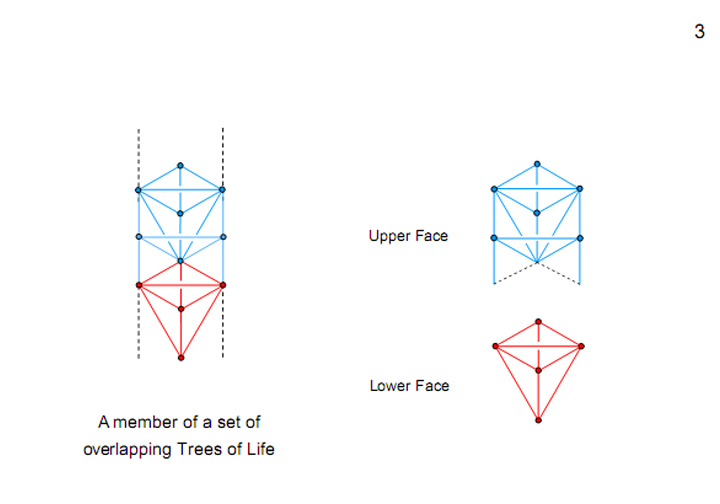 As the Lower Face of the lowest Tree of Life has 21 geometrical elements (Fig. 4) and the Upper face has 34 elements, this is their regular polyhedral counterpart. The first four Platonic solids have 248 vertices & sides in the 120 sectors of their 38 faces. This is the dimension of the rank-8, exceptional Lie group E 8 that plays a fundamental role in superstring theory. It demonstrates that the four regular polyhedra believed by the ancient Greeks to be the shapes of the particles of the elements Earth, Water, Air & Fire do, indeed, embody the physics governing all basic subatomic particles. 248 is the number value of Raziel, the Archangel of Binah (see table in Fig. 1). The square is the symbol of the Pythagorean Tetrad, or number 4. When its sectors are so-called ‘2nd-order tetractyses’ (tetractyses generated by replacing the ten points of a tetractys by a tetractys), there are 248 points (shown coloured) other than corners of tetractyses. The seven coloured points in each tetractys formally symbolize the seven Sephiroth of Construction and its corners denote the Supernal Triad of Kether, Chokmah & Binah. 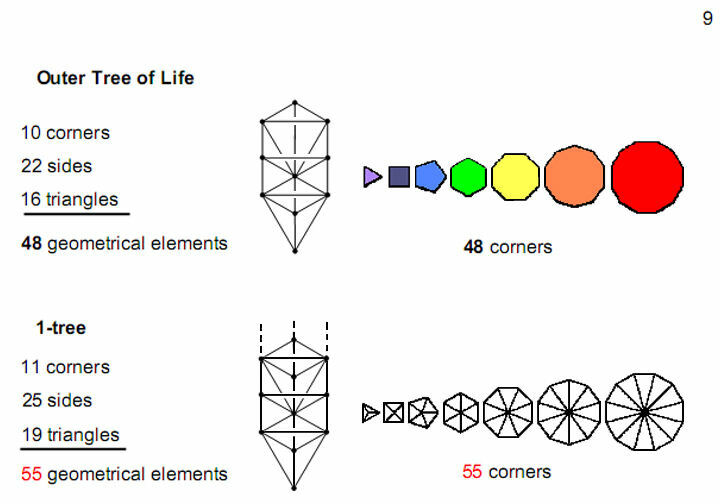 We saw earlier that the lowest Tree of Life has 55 geometrical elements. When its 19 triangles are divided into their 57 sectors and each sector then turned into a tetractys, there are 240 (black) yods generated by this transformation, i.e., yods other than the original 11 corners of the 19 triangles. A similar transformation of triangles outside this Tree generates eight (red) yods below its top. The 240 yods symbolise the 240 (non-zero) roots of E8 and the eight yods denote its eight simple (zero) roots. 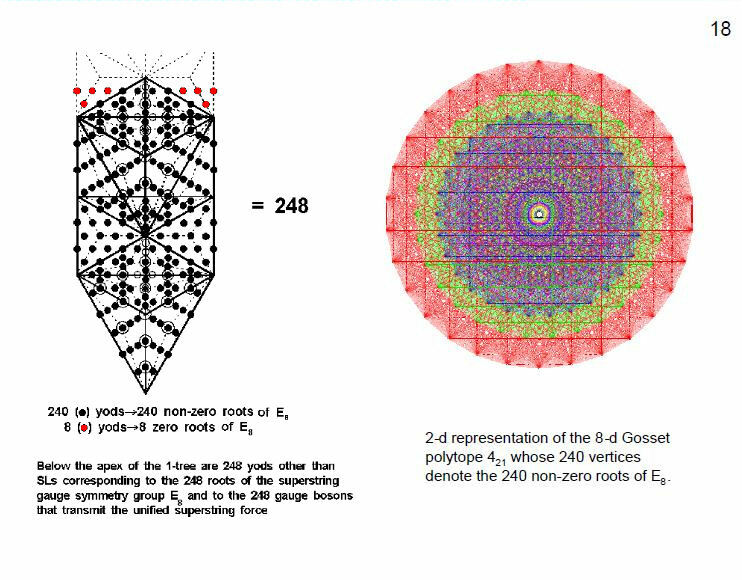 The E8 root system consists of 240 vectors in an eight-dimensional space. Those vectors are the vertices (corners) of an eight-dimensional object called the Gosset polytope 421. In the 1960s, Peter McMullen drew (by hand) a two-dimensional representation of the Gosset polytope 421. The image shown here was computer-generated by John Stembridge, based on McMullen's drawing. (Credit: Image courtesy of American Institute of Mathematics). When the 48 sectors of the seven separate regular polygons in one half of the inner Tree of Life are converted into tetractyses, there are 247 yods other than the given 48 corners of the polygons, i.e., 247 new yods appear. Four yods lie along each edge, so that two extra yods appear when the root edge, now regarded as a separate straight line, is turned into such an edge. One of them is associated with one set of polygons and the second is associated with the other set. 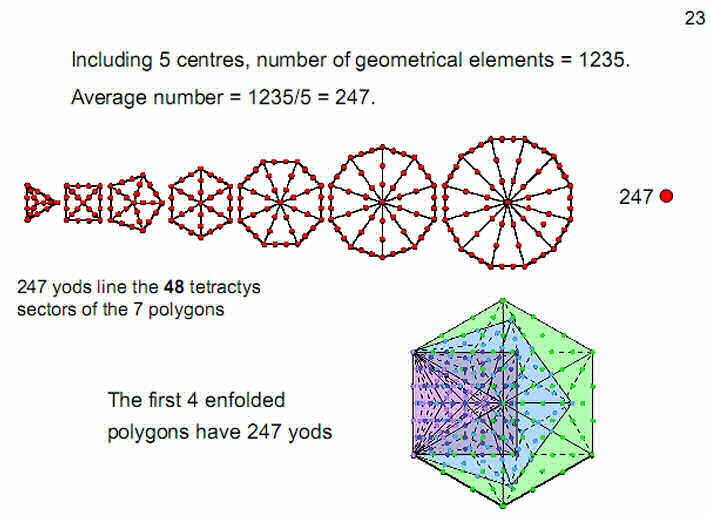 Hence, 248 yods are associated with each set and the root edge separating the two sets of polygons. They symbolise the (248+248=496) roots of E8×E8. The se ven centres of each set and its associated yod on the root edge denote the eight simple roots of E8 and the 240 other yods (called ‘hexagonal yods’ in previous articles because they are located at the corners and centre of hexagons) symbolise its 240 roots. The 240 yods belong to a geometrical object with 55 corners. They are the counterpart to the 240 yods that belong to the lowest Tree of Life that possesses 55 geometrical elements. This is how the tenth Fibonacci number F10 determines the superstring gauge symmetry group E8. Suppose that the 50 faces of the five Platonic solids are divided into their 180 sectors and that their 90 internal triangles, created by joining vertices to their centres, are divided into their 270 sectors. Then suppose that these 450 sectors with 190 vertices surrounding the centres of Platonic solids are each turned into a tetractys. Four yods lie along every one of their 590 sides, two yods being between the ends of every side. 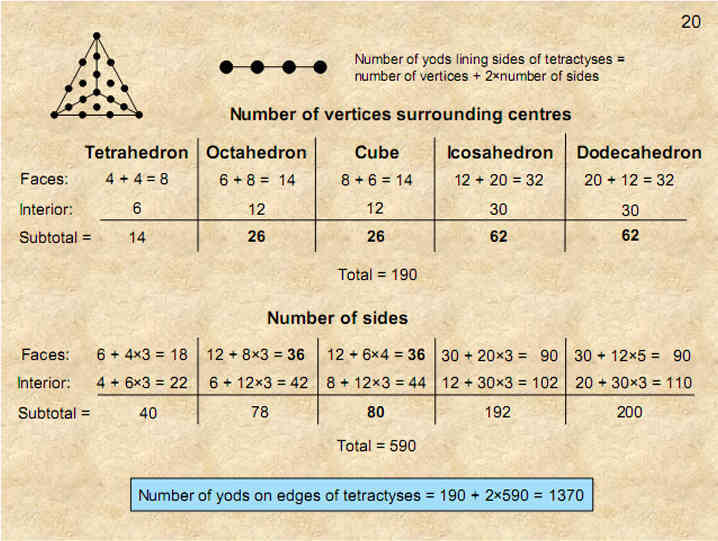 The number of yods surrounding the centres of the five solids and lining the sides of their 450 tetractyses = 190 + 2×590 = 1370. This is the number of yods in 137 tetractyses. The number 137 shapes the archetypal set of five regular polyhedra. It is one of the most important numbers in modern physics, being the number whose reciprocal is approximately equal to the dimensionless fine-structure constant α = e2/ħc ≈ 1/137, where e is the electric charge of the electron, ħ (=h/2π) is the reduced Planck’s constant & c is the speed of light in vacuo. Its magnitude remains a mystery no more. The number 137 is a defining parameter of holistic systems, being embodied in all sacred geometries . When the 94 sectors of the 14 enfolded, regular polygons making up the inner Tree of Life are themselves divided into their sectors and the latter then turned into tetractyses, the resulting 282 tetractyses have 1370 yods. This is the number of yods in 137 tetractyses. It is the same as the number of yods surrounding the centres of the five Platonic solids that line all the tetractyses needed to construct their faces and interiors. It is a remarkable illustration of how different holistic systems embody analogous properties. 1300 = 15 + 25 + 35 + 45. 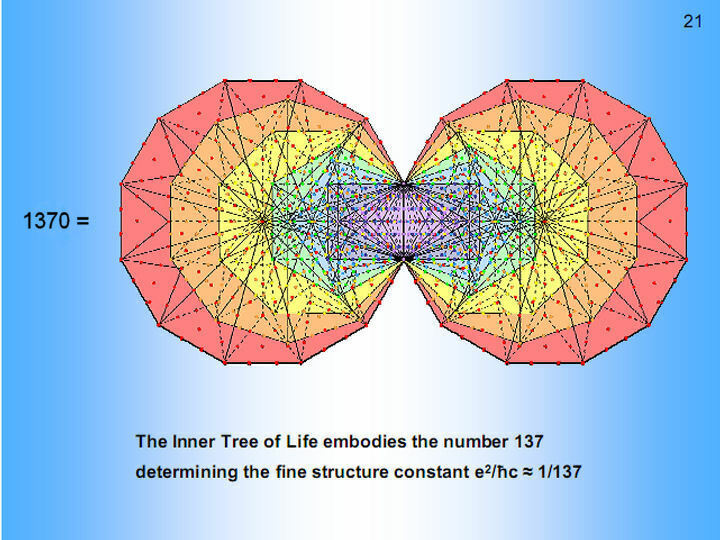 It is an example of the beautiful, mathematical properties of the inner Tree of Life. 10L10 = 10F10 + 10×2F9. The factor ‘2’ expresses the two halves of each solid. The factor ’10’ expresses the ten halves of the five solids. L10 (=123) is the average number of geometrical elements in each half that surround the centres of the five solids and F10 (=55) is the average number of geometrical elements in each half of their faces. The Golden Ratio Φ determines the average geometrical composition of a Platonic solid because L10 = Φ10 + Φ−10. This beautiful property shows how the Decad measures their geometrical composition. 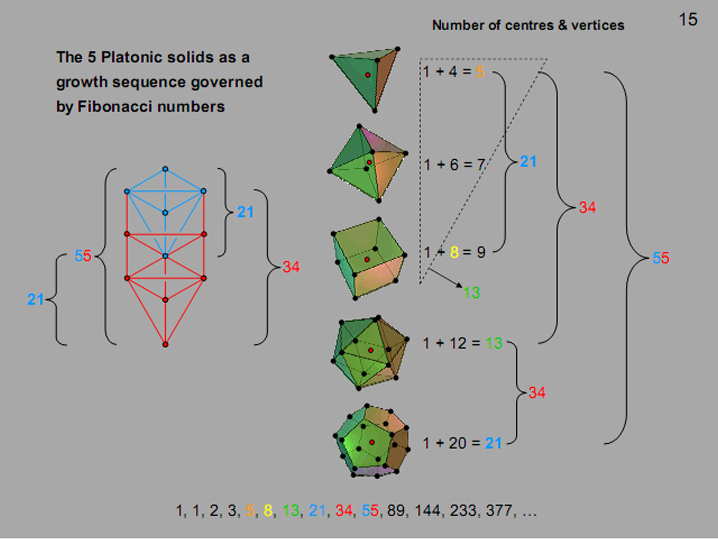 The 55:68 distinction generated by the faces and the interior of the five Platonic solids corresponds in Fig. 5 to the 55 geometrical elements in the lowest Tree of Life and the 68 elements added in the second and third Trees. The five Platonic solids are made up of 1235 points, lines & triangles, including their centres. The average number of geometrical elements is 247. This is the number of yods lining the 48 tetractyses that make up the seven regular polygons of the inner Tree of Life. It is also the number of yods in the first four enfolded polygons when their sectors are divided into three tetractyses. The average number of geometrical elements that surround the centres of the five Platonic solids is 1230/5 = 246. This is the number value of Gabriel, the Archangel of Yesod. 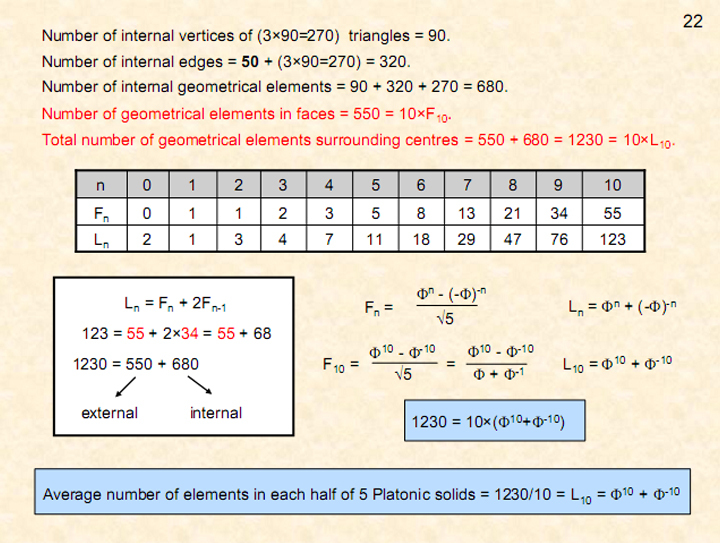 Average number of geometrical elements in faces of each half of a Platonic solid = 550/10 = 55 = F10. Average number of geometrical elements in each half of a Platonic solid = 1230/10 = 123 = L10. Average number of internal elements in each half = L10 – F10 = 68 = 2F9. Number of internal elements (including centres) = 680 + 5 = 685. 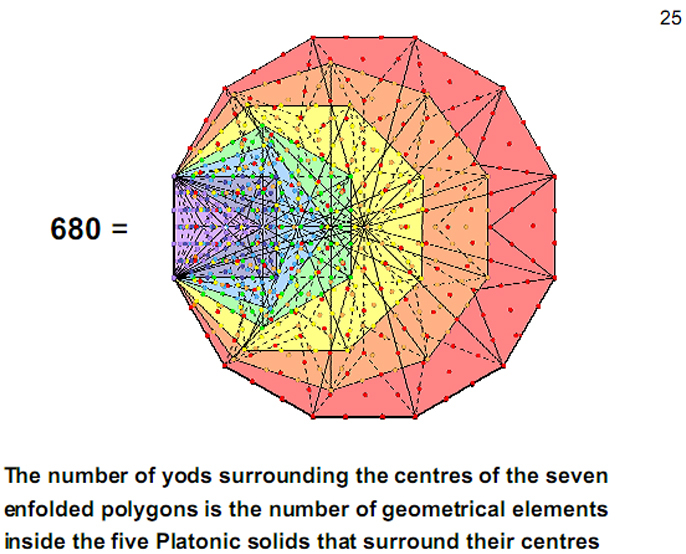 Average number of elements (including centres) inside 5 Platonic solids = 685/5 = 137. = 12 + 32 + 52 + 72 + 92 + 112 + 132 + 15 2. 15 is the number value of YAH, the older Godname assigned to Chokmah. We saw in Fig. 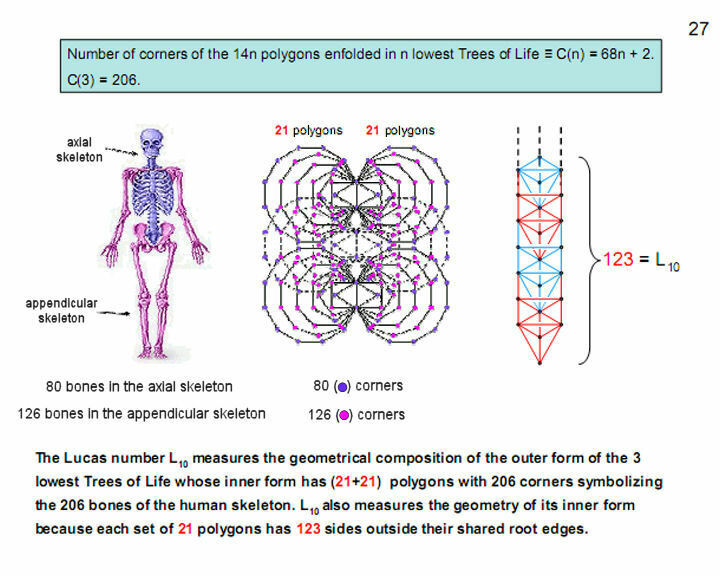 21 that the 14 enfolded polygons of the inner Tree of Life have 1370 yods. Each set of seven enfolded polygons has 687 yods. Therefore, 680 yods surround their centres. This is the counterpart of the 680 geometrical elements inside the five Platonic solids that surround their centres. Their interior constitutes a Tree of Life pattern characterised by the same parameter 680, which is determined by the ninth Fibonacci number 34. We saw in Fig. 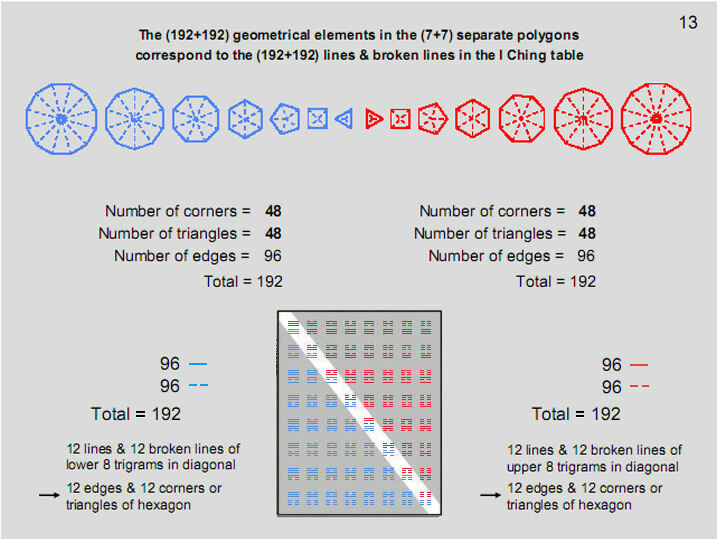 10 that the set of 14 polygons enfolded in each overlapping Tree of Life has 68 corners (two of the 70 corners coincide with corners of the two hexagons enfolded in the next higher Tree). The 140 polygons enfolded in ten overlapping Trees of Life have 680 corners that belong alone to those polygons. Ten such Trees are a representation of a single Tree, with each Sephirah replaced by a Tree of Life. This indicates that the five Platonic solids and ten Trees of Life are analogous sacred geometries. 140 is the number value of Masloth, the Mundane Chakra of Chokmah. 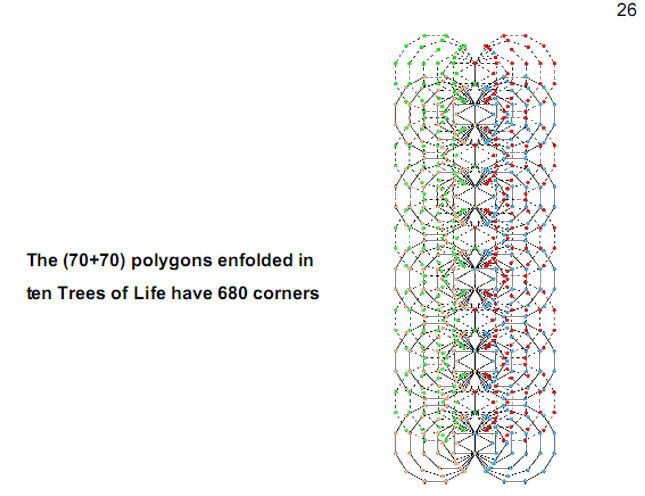 The two sets of 21 polygons enfolded in the lowest three Trees of Life have 206 corners. These Trees map the 3-dimensional aspect of Adam Kadmon, which for a human being is his or her physical body, its skeleton having 206 bones. This is why L10 measures the geometrical composition of these Trees (see Fig. 5). L10 also measures the geometry of their inner form because each set of 21 polygons has 123 sides outside their root edges. The 80 bones of the axial skeleton comprise 34 single bones and 23 pairs of bones, one on the left of the body and one on the right. 34 is F9. 80 is the number value of Yesod, whose meaning, “foundation,” aptly describes this core set of bones. Number of corners of triangles in the lowest n Trees ≡ S(n) = 6n +5. Number of sides of triangles ≡ E(n) = 16n + 9. Number of triangles ≡ T(n) = 12n + 7. Suppose that the three sectors of each triangle are tetractyses. Each triangle then has ten yods inside it. Number of yods in the lowest n Trees = S(n) + 10T(n) + 2E(n) = 158n + 93. 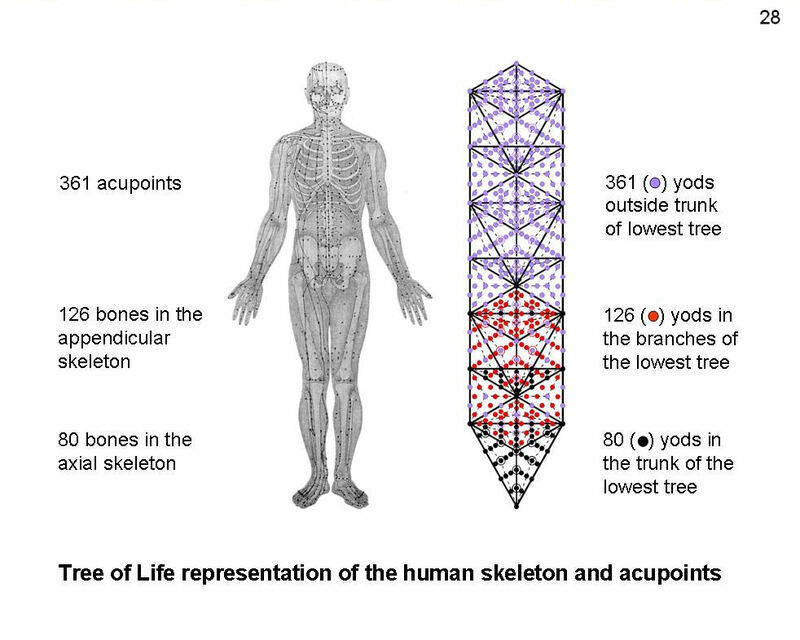 The three lowest Trees have 567 yods, of which 206 yods symbolize the 206 bones of the human skeleton and 361 yods denote the 361 classical acupuncture points (5,6). 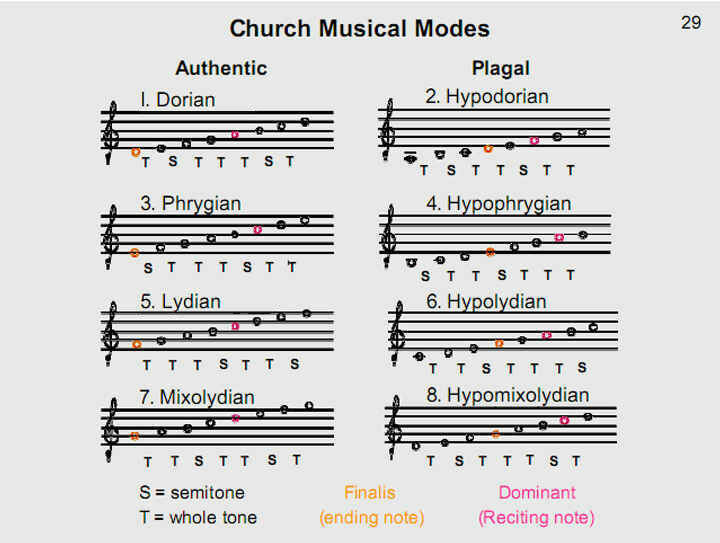 are called ‘plagal.’ They are seven different musical scales with distinct orderings of intervals between their notes, the first (Dorian) and last (Hypomixolydian) having the same pattern of intervals but a different dominant (reciting note) and finalis (ending note) (7). where T is the tone interval of 9/8 and L (leimma) is the interval of 256/243 (the Pythagorean counterpart of the modern half-tone). Figure 30 shows the tone ratios of the seven types of musical scale (the C scale is the Pythagorean scale). Coloured cells denote notes belonging to the C scale and white cells denote non-Pythagorean notes. There are 12 types of notes between the tonic with tone ratio 1 and the octave with tone ratio 2. The last seven notes with tone ratio n are the inversions of their partners in the first seven notes with tone ratio m, where mn = 2. The thick vertical line separates notes and their inversions. Bold tone ratios refer to notes of the Pythagorean musical scale. The table in Fig. 31 lists the intervals below the octave between the notes in each of the seven musical scales and the numbers of each type (8). The 189 intervals comprise 125 intervals with tone ratios equal to the first six types of notes above the tonic and 64 intervals with tone ratios those of their inversions. Of these, 123 intervals have the tone ratios of Pythagorean notes. 123 is the tenth Lucas number L10. They include 47 intervals that are either 9/8 or 27/16 and 76 other intervals. 47 is the eighth Lucas number and 76 is the ninth Lucas number. These are the only possible subsets of intervals that number either 47 or 76 . There are 123 rising Pythagorean intervals (tone ratio n) below the octave and 123 falling intervals (tone ratio 1/n). The number value 246 of Gabriel , the Archangel of Yesod, is the number of rising & falling Pythagorean intervals below the octave between the notes of the seven musical scales. As found in the comment on Fig. 23, this is also the average number of geometrical elements in the five Platonic solids. The counterpart in the Platonic solids of the 123 rising Pythagorean intervals and the 123 falling Pythagorean intervals is the 123 geometrical elements on average in each half of the solids. Number of Pythagorean intervals below the octave = 35 + 18 + 30 + 4 + 12 + 24 = 123 = L10 = 47 + 76 = L8 + L9. For an illuminating discussion of Fibonacci and Lucas numbers and how they appear in nature, see: “The Golden Section,” Scott A. Olsen, Wooden Books Ltd, Somerset, England, 2006. I am indebted to Prof. Olsen for suggesting that these types of numbers play a primary role in sacred geometry because of their connection to the Golden Section. Phillips, Stephen M. Article 46: “How sacred geometries encode the 64 codons of mRNA and the 64 anticodons of tRNA,” (WEB, PDF). Philips, Stephen M. Article 35: “The Tree of Life nature of the Sri Yantra and some of its scientific meanings,” (WEB, PDF). Phillips, Stephen M. Article 1: “The Pythagorean nature of superstring and bosonic string theories,” (WEB, PDF). Phillips, Stephen M. Article 32: “Derivation of the bone & classical acupoint compositions of the human body and their relationship to the seven musical scales,” (WEB, PDF). Phillips, Stephen M. Article 33: “The human axial skeleton is the trunk of the Tree of Life,” (WEB, PDF). Phillips, Stephen M. Article 14: “Why the ancient Greek musical modes are sacred,” (WEB, PDF). Phillips, Stephen M. Article 16: “The tone intervals of the seven octave species & their correspondence with octonion algebra and superstrings,” (WEB, PDF).